Hunab Ku has been a prevalent part of my life since my synchronous reconnection with it in my early twenties, now over 15 years ago. I was drawn to it through rememberance and connective threads by following messages, intuition, signs and guidance received. I then incorporated it into my own “Spiritual Skin” as sacred tattoo art on my sacrum (my 2nd tattoo after the butterfly, which was my first). And, later, it was integrated into one of my paintings, the fifth and last of my In Lak’ech series called “Spirit.” It is part of my life in many ways and the core basis of what I share in message through my work. Its potency of symbolism and message is simplistically beautiful. Mayan Hunab Ku Symbol: One Giver of Movement and Measure. Also known as the Galactic Butterfly is said to represent all consciousness that has ever existed in this galaxy. Hunab Ku, who can see and understand everything, knows that the time for the great change has come. Hunab Ku calls us to realign with the cosmos, which can provide essential energy needed to live together harmoniously and with honor for our Mother Earth. We are not separate from anything or anyone. These are the times in which all races, from all directions, must come together in harmony and unity. The Hearts of All Beings are connected. It is impossible to be disconnected. 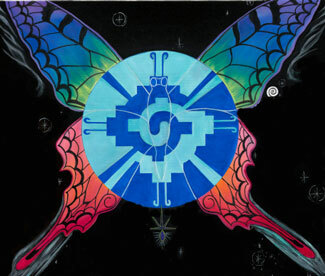 Mayan Hunab Ku Symbol: The Galactic Butterfly - Image from "Spirit" painting as my artistic interpretation. Posted on June 1, 2011, in Uncategorized and tagged 2012, butterfly, Galactic Butterfly, Hunab Ku, in lak'ech, mayans, mother earth, Sacred Tattoos, sacrum, spiritual skin. Bookmark the permalink. 4 Comments. your creative energy has inspired me to have a gallactic butterfly tattoo. I truely feel the spirit and balance of your expression, and am interested in your thoughts and tattoo design to place on my skin. I believe in the balance of our earthly realm with that outside our galaxy, as I feel that I am a starseed in journey across the universe. hello rick! that is so beautiful to hear. thank you. i’m so happy this resonated with you and that you are considering your very own galactic butterfly tattoo. sorry for the delay in response, as i was out of the country, but am getting caught up and wanted to connect. let me know how i may be of assistance. i saw your emails so i will also respond there. much gratitude and love!